Old Dominion | Beer Apprentice - Craft Beer News, Reviews, Interviews and Info. Hello everyone. For today’s craft beer review I’m going to be trying the Old Dominion Morning Glory brewed by the Old Dominion Brewing Company located in Dover, Delaware. I just posted my review of the Old Dominion Double D the other day and I found it to be quite enjoyable. Let’s get back to the website, olddominion.com, and see what it has to say about this particular beer. Morning Glory is a full-bodied espresso stout that utilizes locally roasted coffee beans. Waking up at 9% ABV with the aroma of espresso and the taste of chocolate, she will give drinkers a jolt for a limited time only. Sounds good. Let’s give it a go. This brew came in a 22 oz. bottle and it had an ABV of 9.0%. It poured pitch black with absolutely no highlights showing through. It formed a small, smooth, tightly compacted, khaki colored head from a fairly easy discharge. The retention time wasn’t the greatest and the lacing was a bit underscored and thin. The bouquet was very nice. Tones of fresh coffee bean and espresso. Some dark chocolate and oatmeal added some sweetness. It had a pleasant roasted and toasted malt character too. The overall balance and harmony of the aroma was excellent. The taste, as expected, produced the coffee and espresso characteristics. Somewhat roasted in that aspect. I got some bitterness from both the chocolate and coffee, although no oatmeal savors were found in the taste. It seemed a bit restrained. I definitely thought it would be stronger. The mouthfeel was medium to medium/thin and it only became thinner as I went along. I couldn’t believe that. It wasn’t near as dry as I was hoping it would be either. It was very smooth and slick though. The carbonation leaned toward the lower side and I received no warmth from the 9.0% ABV. An “ok” amount of flavor was left on the palate after each sip. Overall, this was a decent beer. The aroma was by far the most appealing aspect for me. The rest of the attributes weren’t bad, however they were somewhat underscored and not accentuated like I thought they might be. For me, it wasn’t quite on par with some of my favorite Coffee Stouts. Specifically, the Founders Breakfast Stout and the Mikkeller Beer Geek Breakfast. I think I’m being a bit harsh on this beer. It’s still pretty good and I’m glad I got the opportunity to try it. The drinkability was very good and I’d suggest you give the Old Dominion Morning Glory a try if you can grab a bottle and decide for yourself if you think it’s a worthy representation of the style. Feel free to tell me of your opinion if you’d like. Hello everyone. I hope all is well. For today’s craft beer review I’m going to be trying the Old Dominion Double D produced by the Old Dominion Brewing Company located in Dover, Delaware. The website, olddominion.com, was currently undergoing some maintenance, so I jumped over to ratebeer.com and found this…. 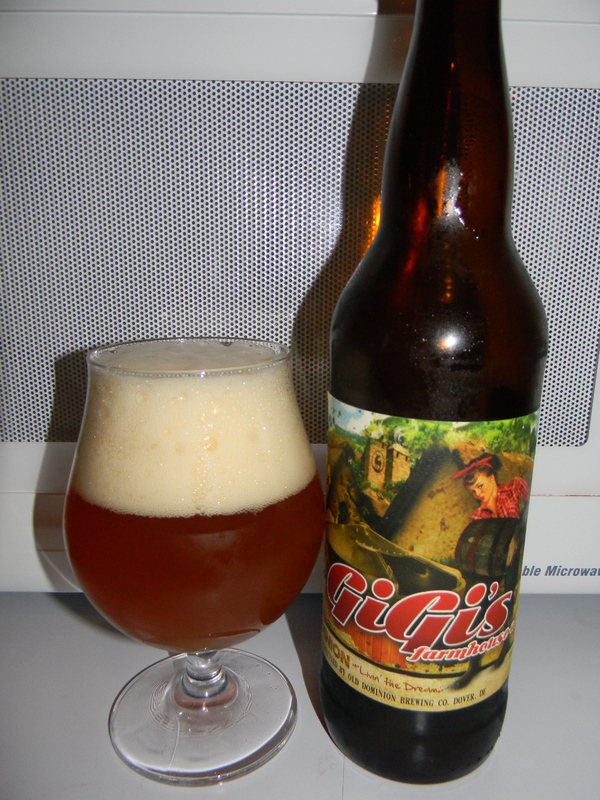 This is a full-bodied American style double IPA brewed with five styles of malts and four different hops. This deep copper colored ale will be served unfiltered to maximize flavor and also dry hopped during the secondary fermentation to ensure a gracious hop aroma. Cheers from us to you and may you enjoy it with friends. This brew came in a 22 oz. bottle and it had an ABV of 10.2%. It poured a reddish to caramel color with some orange hues showing through when held toward the light. The crown was off white, sized ok, and just a touch soapy with a bunch of tightly compacted bubbles. The retention time was alright, however the lacing was a bit meager. The nose presented a very conspicuous dose of caramel malt. Hints of pine and sticky resin as well as wafts of deep grapefruit and dried orange peel. It almost had a kind of cotton candy aroma. A small whiff of alcohol came through at the back end, but all in all, I found it to be a solid bouquet. The taste was a touch more floral than the aroma. Still a lot of the sweet caramel malt and resin though. Some citrus was discovered, although it wasn’t a “bright” citrus like a lot of Double IPA’s seem to have. The orange was more subdued than the grapefruit and the grapefruit was not overpowering. It’s more malt forward for sure. Albeit, considerably bitter and sugary. The mouthfeel was a solid medium. Smooth, sticky, chewy, slick and dry. The carbonation was medium to medium/low. A good deal of warmth was felt from the ABV too and enough flavor was left on the palate to be enjoyed between sips. Overall, I thought this was a good beer. Like I mentioned before, it was a little more malt forward with the caramel than I had anticipated, but that’s not necessarily a bad thing. It’s a fairly easy drink for such a big beer and it’s definitely worth a try if you can obtain a bottle. One thing about it…. I absolutely love the label. I’m totally into those classic “pin-up” girls. So, if you happen to try the Old Dominion Double D let me know what you think. I’d be interested in hearing your opinion.